If you prefer the AF1 to the Dunk, there's finally a wedge for you. Spearheaded by Isabel Marant's high-end take on a wedge sneaker, we've seen the concept trickle down to more traditional sneaker brands over the past few seasons. Nike has released original models such as the LunarElite Sky Hi, as well as reinterpreted classics like a wedge version of the Dunk. If you're more of an AF1 fan though, we have good news. 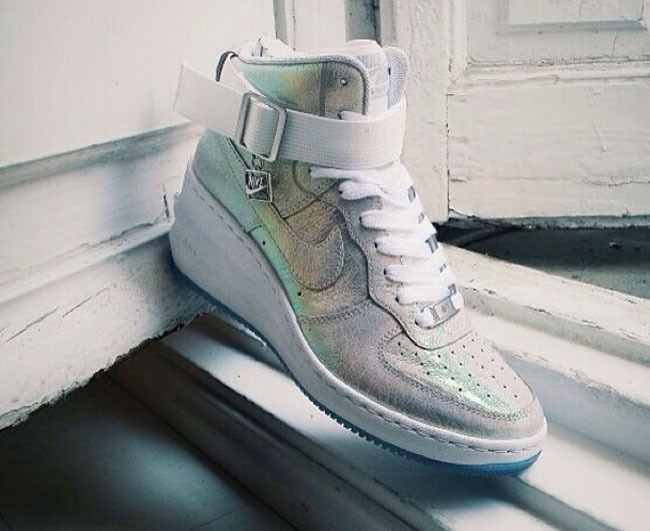 Thanks to misskleckley, we have a look at the Lunar Force 1 Sky Hi. Rather than featuring the hidden midsole design found on the Dunk Sky Hi, the AF1 version is fully visible. This Magnet Grey colorway appears to be on deck for AW 14/15, so you'll have to wait a while if you're interested in these. Let us know your thoughts in the comments.